Bacon is all the rage these days, and for good reason. For one, it’s freaking delicious. It’s also quite healthy and… No, wait. Not healthy. I meant delicious. So it’s delicious, delicious, and… Ok fine, you get the idea. One of the more unique ways I’ve found to enjoy this piggy delicacy is by means of bacon jam. The bacon, it calls to you. Yeah, bacon jam. Sounds weird, doesn’t it? Well get over it, because this stuff rules. If you want to be the talk of the next office potluck and/or the envy of your friends and neighbors, whip up a batch of bacon jam, stand back, and watch the magic happen. It’s very slightly sweet, intensely bacon-y, and marvelously satisfying. 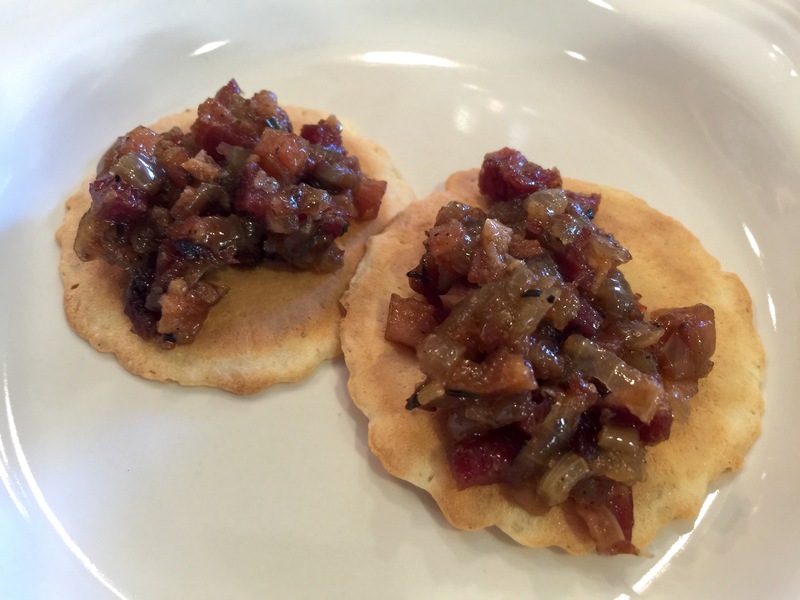 Bacon jam is good on crackers, toast, salads, eggs, pizza… The list is endless. It might even be good on ice cream, but I haven’t quite worked up the nerve to try that yet. This particular recipe is a slight variant of Chef John’s creation as posted on allrecipes.com. Fry up the bacon in whatever way you are most comfortable with, being careful not to overcook it. Crispy bacon good, blackened bacon bad. 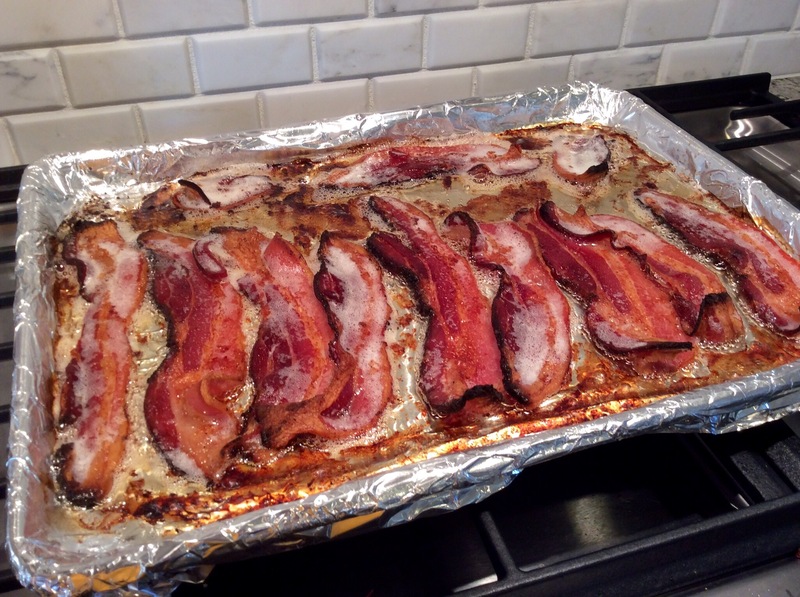 Blot the cooked bacon with paper towels and set aside; reserve a couple teaspoons of bacon grease for later use. Hmmm, what to do with a spare 1.5 lbs of home-cured bacon? Oh I know. Preheat your pot or Dutch oven on medium heat while you finely dice the onions. 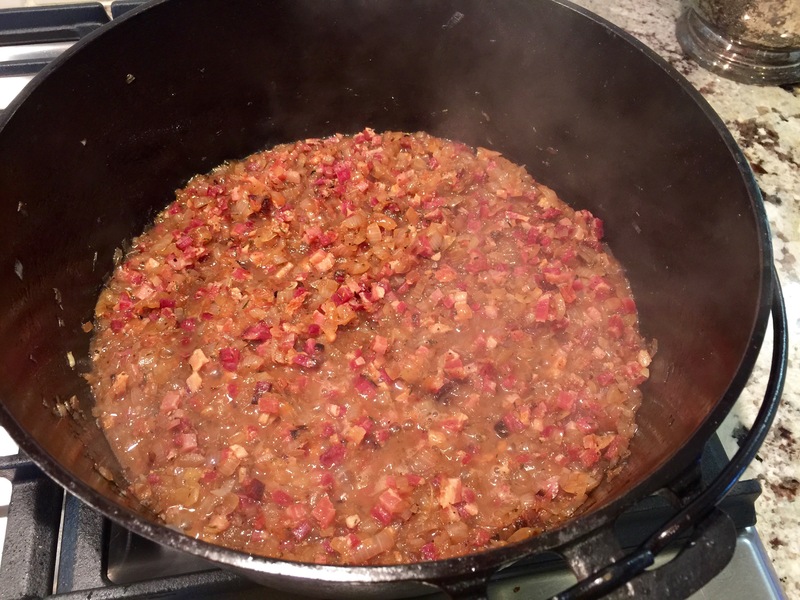 The “standard” recipe calls for 3 onions, but if you want your bacon jam to be extra super bacon-tastic use only 2 onions. Add the reserved bacon grease to the bottom of your pot along with the butter and saute the onions until translucent, about 8 to 10 minutes. This is about what we’re going for. While the onions cook, finely dice the bacon. 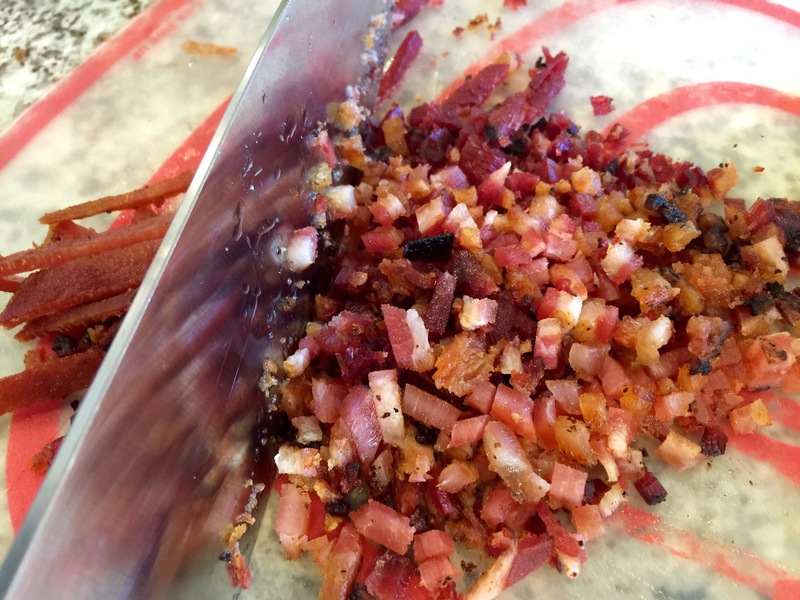 You can use a food processor if you want, but I don’t like the bacon “paste” it creates in the process – I prefer to chop by hand. 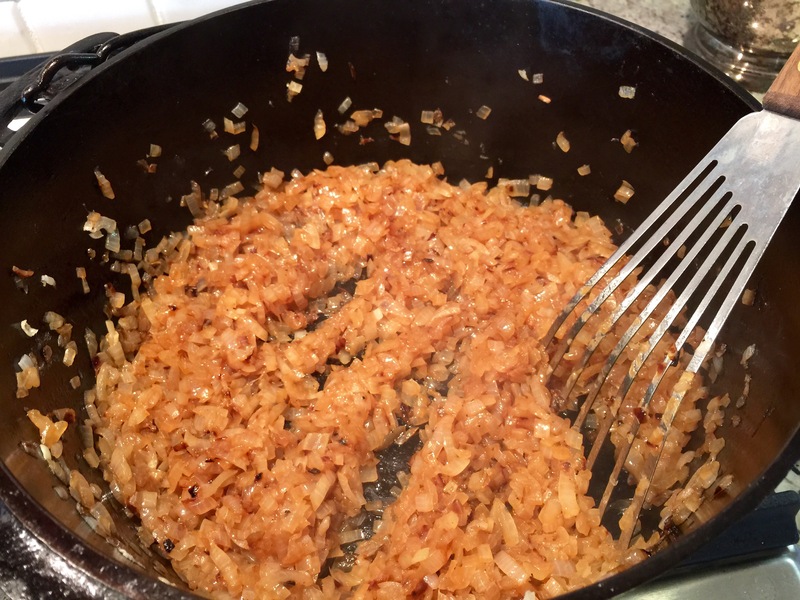 When the onions are done, add the brown sugar, sherry/wine vinegar, 1 teaspoon of thyme (save 1/2 teaspoon for later), cayenne, black pepper, and mix well. Add the bacon and water and simmer uncovered for 10-15 minutes or until a jam-like consistency is achieved, stirring often. Remove from heat and stir in balsamic vinegar, olive oil, and remaining half teaspoon of thyme. And that’s all there is to it. Serve the jam warm with whatever you have handy to eat it with, be it bread or crackers or just a spoon. You’re welcome. 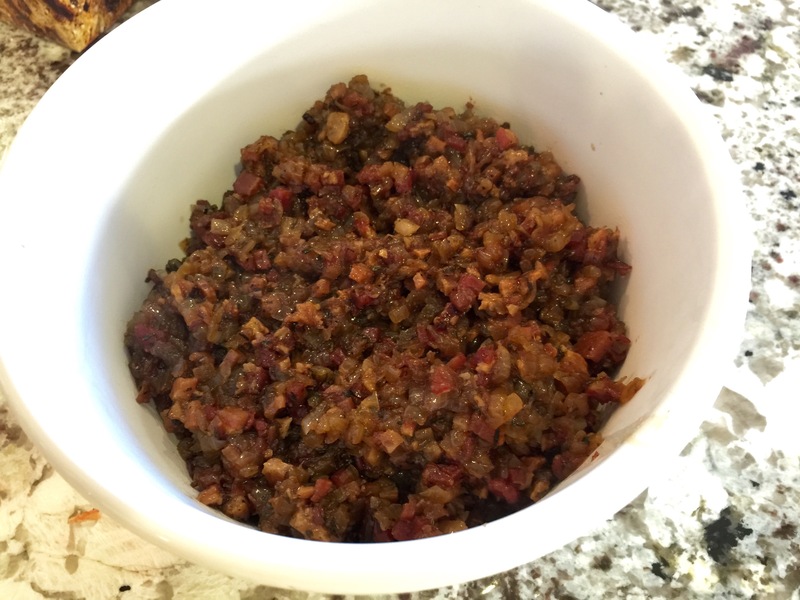 Why bacon jam? Why in the heck not? Cook bacon, drain, and set aside. Saute finely diced onion in butter and 2 tsp bacon grease for 8-10 minutes or until translucent. Add brown sugar, sherry/wine vinegar, 1 tsp thyme (saving .5 tsp for later), cayenne, black pepper, finely diced bacon, and water, stir well. Cook over medium heat 10-15 minutes or until a jam-like consistency is achieved. Remove from heat, add balsamic vinegar, olive oil, and remaining thyme, stir until mixed through. Serve warm. You know what’s annoying? 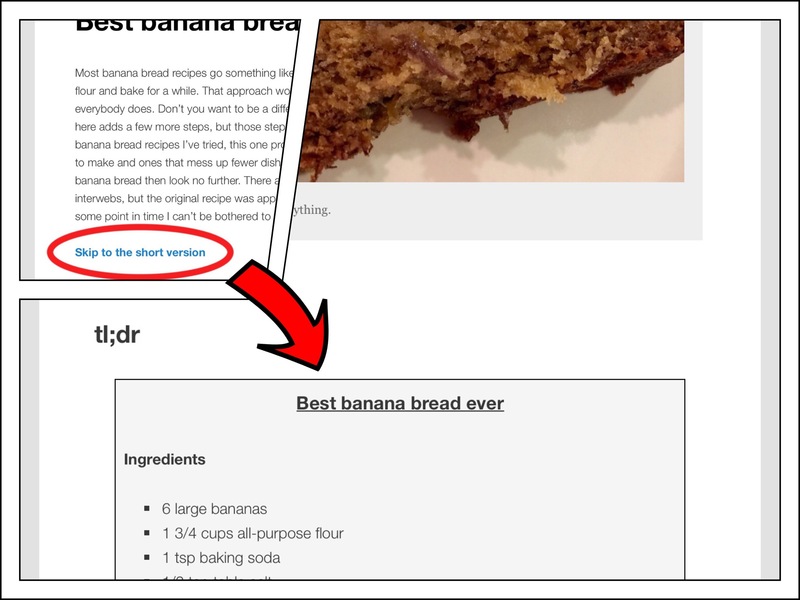 When you find a really awesome recipe online and want to make it, but the guy who posted it on his blog just keeps talking and telling inane stories and generally screwing up the entire recipe without ever really getting to the point. You are then forced to try and scroll through all the blabber without getting melted butter on your iPad, desperately trying to find the next step before your garlic burns. I know this all too well, because this has happened to me. While re-making a recipe from my own blog, in fact. MY OWN BLOG. Clearly, I need to tighten up my recipe directions a bit. And that’s about it. Don’t say I never got you anything nice for Christmas.